On locating the heart in a legal thriller. When Steve James ‎began looking into the curious case of the Abacus Bank in New York, he would come to learn they were the kind of proceedings that were dismissed by court officers as “A paper trial,’ meaning oh, it’s just a bunch of fraud and boring, boring, boring, boring.”‎ However, the director of “Hoop Dreams” and “The Interrupters” was undeterred, quickly picking up from the time he would spend with the defendant Thomas Sung, the founder of Abacus, and his quick-witted clan, including daughters Jill, the bank manager, and Vera and Chanterelle‎, both lawyers, that what might not have been of interest to legal experts was actually a story that was worthy of the big screen. ‎In fact, the trial turned out to be worth bringing popcorn too, as well. 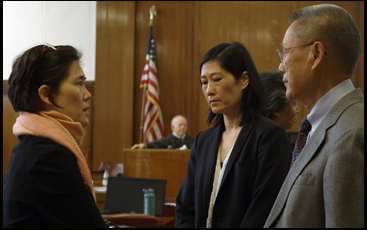 Although James never physically enters the courtroom in “Abacus,” relying instead on colorful recollections from his subjects and the vivid illustrations of Christine Cornell, he quickly transcends the trappings of the trial to capture the injustice of how the small, Chinatown-based financial institution became the only bank to be brought up on criminal charges in the wake of the financial crisis of 2007. In spite of the prosecuting district attorney Cyrus Vance Jr. insisting that he wasn’t trying to make an example of the Sungs after it was learned that a former employee that they had dismissed had been involved in a money laundering scheme, it’s not difficult to imagine the appeal of finding a scapegoat in the bank, a small savings and loan which primarily serves Chinese-Americans, many of whom are generally suspicious of putting their money away but did so because of their trust in Thomas, a pillar of the community. Expecting a quick settlement that would appease public demand for someone to be held accountable as larger banks were getting bailed out, Vance would find instead that the Sungs were on far stronger footing than their industry peers, resolved to fight against the charges no matter how long it would take or how expensive it would be. Yet the Sungs’ steely resolve is driven by the deep abiding love they have for each other and even as “Abacus” undulates with the typical intrigue of a legal thriller, it is downright joyous to be allowed into the room for the family’s raucous dinners and strategy sessions where they often put judicial considerations aside in favor of fussing over personal ones. In other words, it’s another masterpiece from James, who ably speaks to larger issues of social justice while creating a warm, fiercely intelligent portrait of an extraordinary clan and during a recent stop in Los Angeles while the film begins to roll out across the country, the filmmaker spoke about how he first met the Sungs, getting around the obstacle of covering a trial without being allowed into court, and why he still thinks real life is more interesting than fiction. At the premiere in Toronto, you mentioned spending three days filming with the Sungs just to make sure there was a film there. What convinced you? Even before we got to New York, [we were] trying to get permission from the DA’s office to let us talk to them. We were shut down. We tried to get into the courtroom [for the trial] and interestingly enough, the judge was willing, but both the defense and the prosecution did not want cameras in the courtroom, so that was shot down. So we were left with, “Ok, well, the family.” But of course, the family is the story, and once I met them and got their perspective and others on what had happened, I felt like this is not just a really important story to tell, but it’s also an incredible family that I want to spend time with. Because I’m a big believer if you make a film, especially if you’re doing a film where you’re spending time with people — you’re not just parachuting in — I have to be really intrigued and I also, on some level, have to like them to want to spend all that time. That doesn’t mean I’ll endorse everything they do or think they’re flawless, but I have to like them on some level to make that kind of commitment to them. There’s always great respect for the culture you’re entering into in your films — in this case, Chinese-American culture — and I wonder whether you find it a similar process to immerse yourself in an environment in which you may be unfamiliar? There’s always differences that one needs to try to be sensitive to, but there is a similarity of approach. The key, I think, to gaining access to a community that is not mine — and I’ve made a career of that, a lot of filmmakers have [to] go places that aren’t where you’re from — is the trust of the people that you’re following who are from that community. If they happen to be people who are respected in their community, it makes a huge difference as to you’re being accepted and to be able to capture that community. No matter how much you think you may know about a community, I make a conscious effort to remember I don’t know that much. And I’ve done a number of films in the black community and it would be easier in that case for me to get to a point where [I could say] “I think I know a lot about the black community. I’ve spent a lot of time in the black community making these films,” but of course, every time I make a film in that community, I’m reminded of how little I know. So in this case, it was easy because I knew nothing really. I had been to Chinatown in New York to eat at a restaurant and walk around the streets and go, “This is cool.” but that was about it. So Mr. Sung, in particular, was a key way in to that community that allowed us entry, and Don Lee, the activist, was also key, which you see in the film. You walk around the community with Don Lee for five minutes and you immediately get that this guy is somebody people know what he has done for their community, so that was a huge bonus for us to have him embrace us. Since most of your films have been vérité where you could follow your interests wherever they might lead to find the story, did having the structure of a trial already there for a story change how you approached this? I’ve done vérité films where there’s a lot of plot. [laughs] “Hoop Dreams” had a lot of plot. In fact, it had so much plot that’s why it was three hours long, and the challenge in that kind of storytelling was how do we intercut the lives of these two different kids and their families because for most of the time that we follow them they were not even in the same school. But there was no shortage of story happening in that film. Then I’ve done other films where there’s no real plot, like “The Interrupters,” for example, where its very premise is we’re following people over the course of a year and seeing what happens. In this case with “Abacus,” the trial becomes the spine of the film because that’s when we follow the family, so that was a very welcome structural device to have, but even within that, you have to try to figure out a way to present the trial in a way that unfolds in a clear way for people to follow it and hopefully be compelled by it. Another part of that, of course, is conveying this story in human terms, which I wonder if it’s a challenge when you’re primarily interviewing lawyers and bankers, albeit some who have very personal stakes in the case? It was a challenge. One of the challenges was it was such a long trial that at the end of it, there was a total of 8,000 pages of transcribed testimony, so how do you decide what in that five-month long trial do you want to feature in a film like this? That was, pardon the pun, trial and error to figure it out and once we zeroed in on the moments in the trial that we felt were most representative of the case as it progressed, then we set about with our courtroom artist Christine Cornell, who did a phenomenal job. We sent her to court for several days to just make some basic illustrations during the trial that would become the foundation for what we would [do] ultimately in post-production, which was to have her expand that storyboard of the courtroom versus what we would typically see in courtroom illustrations. Is it true you actually suggested certain angles to Christine in creating those illustrations that were like how you might physically shoot it? Yeah, but I love the fact that when people watch this film, they don’t really think about that so much. They see the courtroom illustration style — and [Christine is] really brilliant at it —and it immediately plugs into something that we’ve all seen because there are so many trials that you couldn’t have cameras in, but we’ve seen trials in the media. What people don’t necessarily pick up on, but they clearly feel it in watching the film is that there’s angles there that we’re showing that no courtroom artist could ever get. Never in a real trial [would] you have seen an angle looking over the shoulder of a witness looking into the eyes of the lawyer interrogating them because they don’t get to go sit behind the witness, so they don’t get to do those illustrations. But Christine is such a fabulous artist, not just a fabulous courtroom artist, that she was able to establish the courtroom [style] and then create all these different angles that hopefully are able to bring it to life in a way that made it compelling for you. Another well-done aspect of the film are the graphics that illustrate the larger financial crisis of the big banks, but such a surprise to see in one of your films when you’ve so often relied on vérité footage to tell a story. Did that come naturally for you? Well, I like to surprise you. [laughs] Again, if you look at the entire body of my work, there are films that you would call outliers to that vérité tradition. A film like “Life Itself,” for example, has a strong vérité thread of Roger and Chaz’s life in the present, as it turned out to be the last four months of his life, and there’s an urgency to that that is in the movie. But around that is a biographical story of a guy’s life and there’s all kinds of text on the screen — quotes from his reviews, e-mails between me and Roger — so I don’t have hard, fast rules about what I will do and what I won’t. I really approach every film from the standpoint of within my ability as a filmmaker, what do I think is the best way to try to tell this story? So I’m shameless. [laughs] I don’t have a rigid aesthetic about any of that or a purity about any of that. In this case, it felt like statistics on the screen helped to convey things that would be much more difficult to do otherwise or taken much longer and we tried to do them in somewhat artful ways. One of the sections of the film that I’m really happiest about — that’s not the vérité parts with the family — is how [we illustrate] the backstory of what happened to the big banks. Because I said to my team, ”The thing I don’t want to do,” and an early cut [of “Abacus”] did this, “is to see the bull on Wall Street, the guys that were indicted testifying, or the ticker tapes” — all the imagery we’d already seen a million times when it comes to anything about the big banks and Wall Street. Our team spent a lot of time on it and that’s when I came up with this idea that I would love to just see the power of those institutions through seeing their skyscrapers and then using onscreen statistics to really tell you in very stark terms what they did. I’m really excited about how that turned out because I felt in a very simple and direct way, it got at the heart of what went on with the big banks so that you could place it in context of what was going on at that specific time. You introduce the story through “It’s a Wonderful Life,” automatically drawing the parallel between Thomas Sung and George Bailey. Was it much of a decision to cast Mr. Sung in that light from the start? That kept popping up in the course of telling this story. There’s a reporter in New York City, Ti-Hua Chang, who brought it up when we interviewed him and it’s in the film [where] he says, “Look, you have to understand something about Mr. Sung. He is George Bailey in ‘It’s a Wonderful Life’ in this community.” Then of course, the parallels between the bank run that happened with Abacus in 2003 and the one that happens in “It’s a Wonderful Life” and the way in which it was the trust of the community in Jimmy Stewart and Thomas Sung that saved those institutions, was such a great parallel that when I found out that yes, Mr. Sung had seen the movie a fair number of times, but that his wife, Mrs. Sung watches it religiously every year, I said, “Okay, well, we have to film that.” And that led to this idea that it would be great to start the film with that [because] it’s a very entertaining and unexpected way to begin a film like this. When you watch it with audiences, people start chuckling when Bedford Falls pops up as the very first image in the film. But there was something more serious at work there in that choice and it’s that this film from the start is basically saying to the audience, “We’re with this family. We believe them to be innocent. And we’re not making any bones about it.” That decision, of course, was made not on day one of filming. That was arrived at by the time we got around to editing [after spending time with them], that we’re with this family, we believe them to be innocent and we’re telling this story from their point of view, but I think what then surprises people is that we then also go about the business of presenting the case pretty specifically against them from the people who tried the case against them, so we give the audience credit for being able to hold both of those things in watching this film and arrive at some decisions for themselves — whether they agree with the film essentially. It says so much about the family, but being incidental to the trial, at least superficially, that might end up on the cutting room floor for other filmmakers, so is that in the film from the moment it’s captured for you? Oh yes. I love that you brought that scene up because that’s one of those scenes, and I can point to scenes in other films that occupy a similar place in my mind, that gets to the very heart of why I love making documentaries because it’s such an unexpectedly revealing scene. I like to say if you were writing this story as a biopic, it would take a pretty brilliant writer to come up with that scene [because] if you were saying to your writer, “I want a scene built around a dry chicken sandwich and the daughters bickering with dad, hovering over him as dutiful daughters, worried about everything including this sandwich,” they’d say you’re out of your mind. What kind of scene is that? That doesn’t make any sense, but in the movie, it’s such a wonderful, funny and revealing scene. That’s why you make documentaries because real life, in my humble opinion, is always so much more original and surprising than anything most filmmakers or writers could make up. When spending time with the family, especially during those big dinners, you’re able to capture everyone in the room. Are those scenes difficult to cover? It isn’t easy and there are times in the films I make, but they’re usually big events, where I’ll have more than one camera. But 95% of everything I’ve made over the years, it’s been one camera. You just have to be quick on your feet and have a good cinematographer, which we did with this film. Tom Bergmann did a great job. And after you’ve done this for a while and you work with good people, you learn how to shoot a dinner in a way that you feel you can really cover it. You know you never have the camera in the exact right place, but that’s okay. This is a mistake that sometimes younger filmmakers make — they drive themselves crazy because they didn’t get a great comment on camera in a vérité moment, but the truth is a lot of times, it’s the reaction to a great comment that’s the most interesting thing to be on. I take comfort in that, and another thing I love about documentary is that when you’re in these vérité moments that are meaningful, there is this realization by everyone involved that this is happening now and we have to get it now. We can’t say, “Okay, let’s get it in take two. Good filmmakers are at their best when stakes are highest. “Abacus: Small Enough to Jail” is now open at the IFC Center in New York and opens in Los Angeles at the Nuart on June 9th. A full list of theaters and dates is here.